We welcome the 2018 Forza 300, which has a new look and much tighter, sharper dimensions than the previous design. Its wheelbase and length are reduced and it's narrower, but has a higher seat for improved visibility. Even with a new larger diameter rear wheel, it is 8kg lighter thanks to a revised chassis and redesigned frame, which boosts acceleration, top speed and fuel efficiency. Smoothly adjustable, the new electric screen provides maximum wind protection at speed or ultimate freedom around town. Honda Selectable Torque Control (HSTC) has been added and can be switched on and off from the left handlebar. Revised instruments serve up extra information digitally, in support of the analogue dials and all lighting is LED. The liquid-cooled fuel-injected SOHC four-valve engine has power characteristics tuned (via a gas flowed head, long reach spark plugs and altered valve timing) to deliver an entertaining ride at low, mid and high rpm - plus excellent fuel economy. 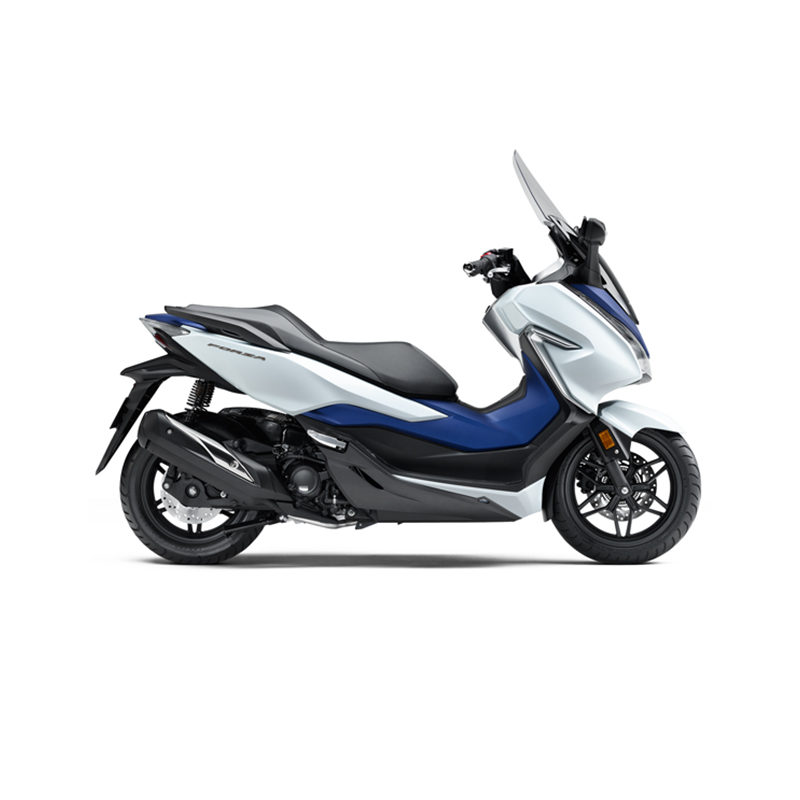 A significant new feature for the 2018 Forza 300 is Honda Selectable Torque Control (HSTC) - the first time the system has been fitted to a Honda scooter. HSTC detects any difference between the front and rear wheel speeds, calculates the slip ratio and then controls engine torque via the fuel injection to regain rear wheel traction. HSTC can be switched ON-OFF via a switch on the left handlebar. A 'T' indicator in the digital display flickers when the system is working to manage grip. The Forza 300s engine is well-proven and engineered to last - a roller type rocker arm, plain journal crank bearings and sealed crankcases deliver long-term reliability; oil capacity is 1.7-litres and a 5mm offset cylinder reduces internal friction. An automatic centrifugal clutch works a V-Matic transmission (with ratios set for fast low speed reaction and smart acceleration) and belt final drive. Bore and stroke are 72mm x 68.6mm, with a compression ratio of 10.5:1. The new models 8kg weight loss helps performance and fuel economy. The fuel tank holds 11.5-litres. Compared to the previous model, it is 25mm shorter in overall length, at 2140mm. Seat height has been raised 62mm to 780mm and the riding position is naturally upright, promoting excellent all-round visibility. Handlebar width is now 755mm (2mm narrower than the previous design) with front width of 580mm and mirror width of 860mm - compact dimensions to make slipping through traffic-heavy streets easy. Sturdy 33mm telescopic forks are matched by twin rear shock absorbers - adjustable through 7-stage spring preload - working through a 1-piece aluminium swingarm. The cast aluminium 15-inch front wheel is fitted with a 120/70-15 tyre while the 14-inch rear (1-inch larger in diameter than the previous design) wears a 140/70-14 tyre, offering maximum traction and ride comfort. A 256mm single disc performs stopping duties up front, mated to a 240mm rear, with the benefit of 2-channel ABS for braking control on slippery surfaces. The Forza 300s design lines flow back from a new electric screen, controlled by a switch on the left handlebar, which adjusts smoothly through 140mm. It is designed to provide wind protection (with airflow directed around and over the rider's head) and reduce wind noise. Stability and comfort at higher speeds - and for long distances - can be instantly exchanged for a greater sense of freedom with the screen in its lower position by simply pushing a switch on the left of the screen to move it to any point in the 140mm range. Two full-face helmets can be stored under the seat and it's also possible to partition the storage area to house a helmet and/or rain gear and A4 sized bags. The front left inner fairing pocket is lockable, and its internal space can be arranged for the rider's convenience, to hold a phone and/or water bottle, for instance. It also houses a 12V charging socket. All lighting is LED. To make daily life on board the Forza that little bit more convenient it's now fitted with the Honda Smart Key system. The Smart Key itself resides in the rider's pocket and does away with the need to constantly insert and withdraw a key for ignition, fuel cap and seat. Revised instruments present analogue speedometer and rev-counter dials flanking a digital display that can switch between 3 modes (controlled by a switch on the left handlebar): odometer, range remaining and current mpg; trip meter, average mpg and timer; or ambient temperature thermometer and battery sensor.